“I grow my own food as the nature allows. Never a day goes without plucking the fresh fruits from the trees and having it on my plate. Eating local varieties of unpolished rice is good for health so I grow nutrient packed paddy myself and process it as per my requirement. We love pickles so we grow special varieties of mango, gooseberry and lime only for making pickle. Being a South Indian, I like to eat sesame oil so I grow sesame seeds in the farm, get the seeds processed to make oil and cook my food with it. The list goes on. These are the luxuries of living in a village that were never experienced in Mumbai,” affirms Mr. Venkat Iyer, farmer by choice. Mr. Venkant Iyer worked as Project Manager for software implementation in IBM for over seven years. A dream job for many, he was doing very well at work, good paycheck and was given all possible comforts. However stress and no-free time were inseparable parts of this city job in IT industry. On the contrary, he felt living in the village and working in the farm would be more peaceful and fulfilling. Of course, it is a dream life for numerous people living in the city. Stuck in the dilemma for around six months to make a pick, with detailed financial analysis of these two diverse professions, umpteen discussions with friends and family, Mr. Iyer finally took the decision in the favour of dream life over dream job! He resigned from his job in November 2003 and became farmer on 1st January 2004. He speaks about his journey being a farmer, simple farm life, crop selection and on-field experiments. My fascination with farming started when my wife Meena, journalist by profession was writing a book on organic cotton. She used to travel to remote villages and interact with the farmers directly. On her return we used to talk about these farmers, their lifestyle, crop cultivation etc. I found it all very interesting and always wanted to know ‘something more’ about living in village and life of a farmer. Finally I asked her what if I become a farmer! She responded enthusiastically and encouraged me with my new idea. It motivated me immensely and after lots of thinking and analysis I became the farmer. Our farm is located in Peth village, Palghar district, Maharashtra. I bought it in February 2004. The total land cover is 4 acre. It is an agricultural land near perennial river Surya. So I have consistent water source and electricity keeps playing hide and seek but it is fine, we are used to it. The farm already had a house and 70 sapota trees. Now we live here. 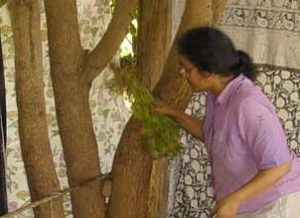 I retained all the trees and planted my first crop, green gram on insistence of a village resident turned friend in March 2004. 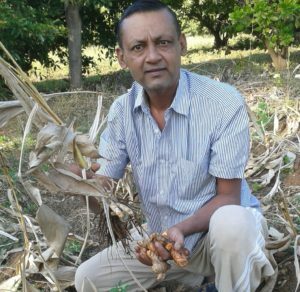 The seeds were sourced from Surat. It was amazing to see the plants grow and I never thought beyond it. Yield was not a concern! In the meantime being a first-generation farmer I started reading books and surfing internet on farming. Then I decided I am never going to use any chemicals in my farm because my idea of farming was to live a self-supporting life on farm, eat healthy, breathe clean air and enjoy the peaceful time. Moving forward on same decision, I didn’t spray any pesticide on the plants allowing it to grow naturally. 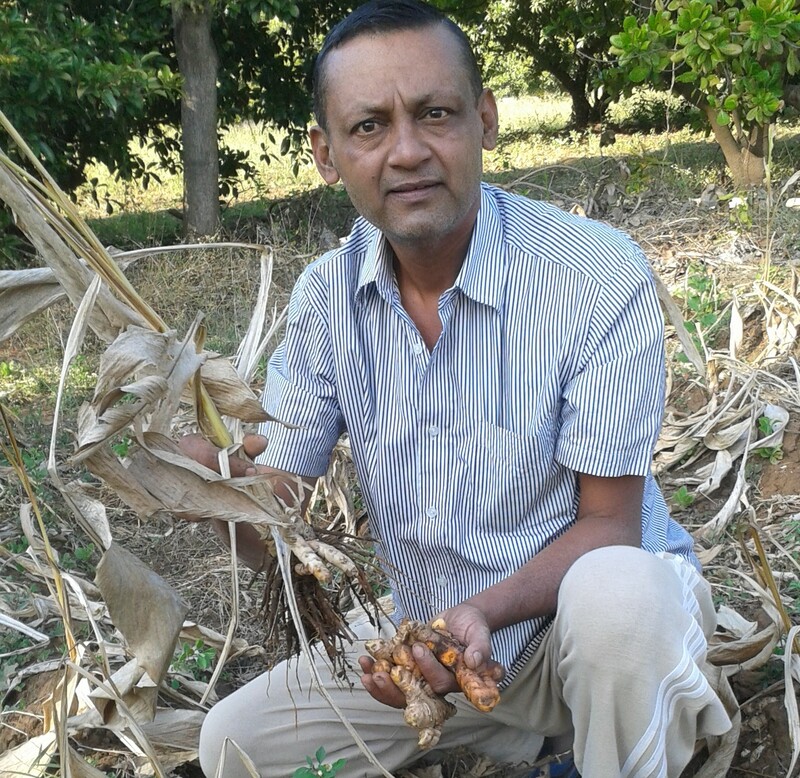 The yield obtained was 300 kg moong from 2.5 acre. It was a big morale booster and I continued farming in most natural way without any use of chemicals for sure. 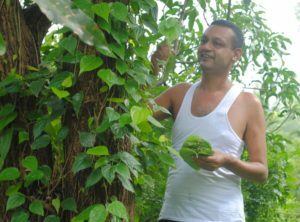 I tried to grow food items that are required in our everyday diet such as fruits, vegetables, spices, grains, pulses, oilseeds and so on because the aim was first to feed me and my family and sell the produce only if it was in surplus. The crop selection was made as per the local climatic conditions, only traditional varieties of crops were preferred because the strength of desi food is supreme and farming practices selected were sustainable in all aspects. Crops grown are Kala Karjat and Kudai (red colour) indigenous paddy varieties; sesame and groundnut for oil; pulses grown are green gram (moong), black gram (urad), vaal (kind of broad beans); turmeric, mustard and pepper as spices; local vegetables. The farm already had sapota trees that continues to fruit all round the year. Apart from this I have planted a wide array of fruits like 5 varieties of mango namely alphanso, kesar, malgova, rajapuri and local variety for pickle; lime; gooseberry; mulberry; 4 types of banana namely robusta, yelakki, red banana (coimbatore) and one variety of raw banana; 3 varieties of jackfruit; Indian almond; 4 varieties of guava – pink, white, round and conical and I keeping adding the trees as and when as I can. I have 2-3 trees of every fruit. Seeds and saplings were sourced from multiple sources. I got Kala Karjat and Kudai paddy varieties from a tribal farmer in some remote village in state. Earlier all farmers were growing these varieties but now it is endangered as farmers are moving to hybrid seeds. I am growing it for past 10 years and extremely satisfied with the taste, health benefits and yield. Farming inputs are prepared from dung and urine of desi cow but I don’t have a cow in the farm. I get the same from a nearby gaushala of abandon desi cows. Also I have 20 hens in the farm. Sowing is done based on the season. The cycle begins from monsoon with paddy cultivation in one part, urad in second part, seasonal vegetables in third part and turmeric in fourth. On bunds across the farm I grow pigeon pea (tuar), a local variety white in colour. After harvesting rice in the same patch sesame is planted along with mustard as intercops. After harvesting sesame I grow groundnut and then moong. In this way it is one complete cycle. The crops keep shifting from one section to other following the thumb rule of crop rotation to allow the soil to restore its fertility and nutrient content. Vegetables are changed continuously as harvested. I grow only local vegetables exclusively for personal consumption because vegetables have short shelf life and travelling to Mumbai often is tough. Some or the other fruit is plucked every day to be on the plate. However this year we had bumper yield of mangoes that we cannot eat so it will be sold. The surplus farm produce is sold at two organic stores in Mumbai, one run by my friend and other by Ms. Vandana Shiva. They fix the price and I take the money with no-questions asked! These are fair stores and I trust them completely. Processing is done in and around the Peth village mainly for paddy, oil and dals. I have traced all these units and it is hassle free activity. Life is too peaceful as a farmer and very much sustainable. All it requires is to willingly accept and adjust to the local food and environment. Besides, farming is fun for me because I keep experimenting all round the year with crops and methods. I believe in holistic farming practice that implies soil, trees and plants are living beings just like man and livestock. The soil is living only when it has alive earthworms and microbes in it so I am more focused on soil than the plant. If soil is healthy plant will grow naturally. Agriculture may not be the brightest profession in today’s world but it is definitely a noble profession. Until the consumers realizes the effort and labour put in by the farmer and agree to pay his/her due farming can never be a profession of choice for many!